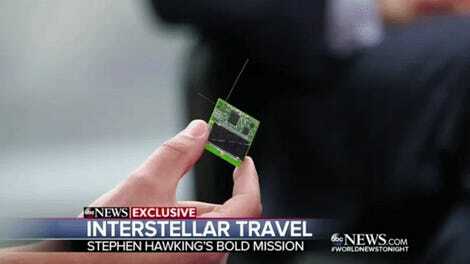 Last year, Stephen Hawking and Russian billionaire Yuri Milner hatched an ambitious plan to send a tiny probe to the Alpha Centauri star system. Travelling at 20 percent the speed of light, the researchers weren’t entirely sure how the probe was supposed to stop once it arrived at its destination, or whether it would even be able to. Excitingly, a pair of European scientists now say they’ve solved the problem. In a new paper published in The Astrophysical Journal Letters, physicist René Heller from the Max Planck Institute, along with computer scientist Michael Hippke, has shown that the radiation and gravity from Alpha Centauri’s stars can be used to decelerate an incoming probe. So instead of whizzing by in a flash, the lightsail-driven nanocraft will hit the brakes, slowing down enough to explore the system’s trio of stars—and even the Earth-like planet Proxima b. As part of the Breakthrough Starshot Initiative, Milner plans to invest $100 million in an effort to develop an ultra-light autonomous lightsail that can be accelerated to one-fifth the speed of light (60,000 km/s, or 37,350 miles/s). At this ludicrous speed, a sail-driven robotic probe could reach Alpha Centauri—the closest star system to Earth—in just 20 years, as opposed to 100,000 years using traditional chemical thrusters. Under the original proposal, a tiny probe would be mounted to a small, meter-sized light sail, and driven away from Earth by a phased array of lasers. The energy produced by the lasers could theoretically accelerate an object thousands of times faster than the fastest spacecraft today. But this isn’t the only scheme being considered. Under Heller and Hippke’s plan, a much larger “photon” sail would replace the laser array. The probe itself would measure a few inches across and weigh just a few grams (sorry, no passengers on this trip!). To propel it through interstellar space, the device would be attached to large, square-shaped sails. In addition to being big, the sails would need to be exceptionally light, and thus very thin. Radiation emanating away from the sun would push the probe in the direction of Alpha Centauri. Once enough gravitational inertia is acquired, the probe would retract its sails for the long journey ahead. Under this scheme, it would take the probe about 95 years traveling at 4.6 percent the speed of light to reach Alpha Centauri. It’s nearly five-times longer than Milner’s original timeframe—but excitingly, the probe could theoretically be made to stop. Given this limitation, and without a solution, it was assumed that the probes would zoom past the Alpha Centauri system similarly to how the New Horizons flew past Pluto. But at near relativistic speeds, the probe would likely experience great difficulty taking accurate and meaningful measurements of the star system itself. 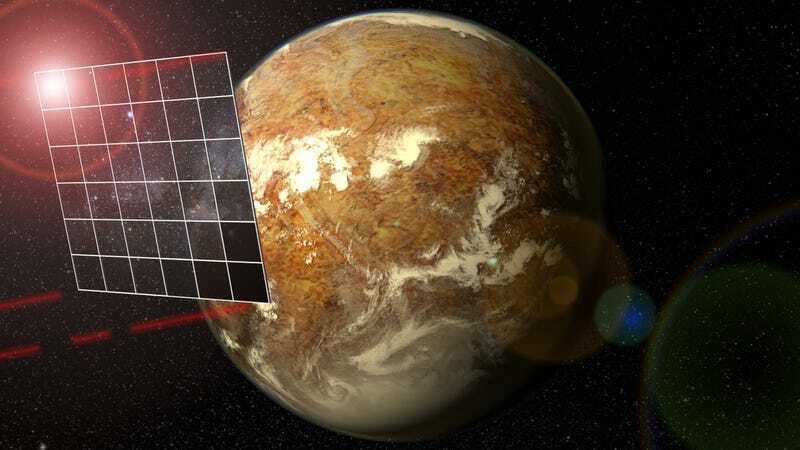 Thankfully, however, there may be a solution—one that would not just slow down the nanocraft to more manageable speeds, but allow mission scientists to explore the Alpha Centauri system in great detail. Above: An animation showing the “photogravitational assist” at Alpha Centauri A. For this plan to work, the probe would redeploy its sail on arrival, leveraging the incoming radiation from the stars in the Alpha Centauri system. Using a computer simulation, Heller and Hippke based their calculations on a 100-gram space probe attached to a 100,000-square-meter sail, which is about the size of 14 soccer fields. As the probe gets increasingly close to the star system, the braking force increases. On arrival, instead of using solar photons as a propulsion force, the sail “catches” the outgoing solar radiation from Alpha Centauri, gradually slowing the vehicle down. Ironically, the same physics that will push the probe away from our solar system will be used to slow it down at its destination. During the deceleration maneuver, the tiny probe will need to approach the star Alpha Centauri A to within five stellar radii (i.e. a distance equal to five-times the width of the star), or about four million kilometers, in order to be captured into orbit. By this point, the nanocraft will have slowed down to about 2.5 percent the speed of light. Failure to slow the craft down from its maximum cruising speed (4.6 percent the speed of light) would fling the probe away and back into interstellar space. Every successful journey starts with a map. This one shows the maneuvering of the autonomous “nanocraft” as it decelerates at Alpha Centauri A, makes a quick four-day journey to Alpha Centauri B, and finally proceeding on a 46-year trip to Proxima Centauri—home of an Earth-like planet. Once at Alpha Centauri A, the star’s gravity can be used to maneuver the probe, similar to the “slingshot” maneuvers used to direct probes like Voyagers 1 and 2 around the solar system. Theoretically, the autonomous probe could settle into an orbit around Alpha Centauri A and explore its planets. Excitingly, Heller and Hippke have also outlined a plan for sending the probe to the system’s other stars, namely Alpha Centauri B (the binary companion to Alpha Centauri A) and Proxima Centauri (a distant third star located about 0.22 light-years (1.2 trillion miles) from A and B’s common center of mass). Under this plan, it would take the probe about a century to reach Alpha Centauri A, a few days to reach Alpha Centauri B, and then another 46 years to reach Proxima Centauri. But the added years would be worth it. In one of the most remarkable discoveries of 2016, astronomers learned that Proxima Centauri hosts an Earth-like planet. It’s one of the most tantalizing objects of inquiry within striking distance—and we finally have a plan for observing it up close. Data collected by the probe would take a little over four years to reach mission scientists on Earth (given the extreme distances involved, we’re going to have be patient with such things, and get accustomed to such long term planning/thinking). A system for sending the data back still needs to be developed. Next, Heller and Hippke plan to present their study in detail to the Breakthrough Starshot Initiative at its upcoming Breakthrough Discuss meeting in Palo Alto in April. Ooooh, such a tease. As always, Gizmodo will be on the lookout for when this research is made public. Until then, let’s celebrate the fact that we’re a step closer to embarking on humanity’s first interstellar space mission.